Zimmah the djinn isn’t evil. He simply thinks the world would be more fun if everything was made of desserts. So when ten-year-old Karim Jacobs makes a wish to fix his parent’s marriage it’s not Zimmah’s fault that he twists the wish. He couldn’t help himself. Candypunk airships and cupcake castles are cool! 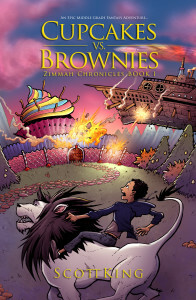 Of course Karim isn’t happy about his wish going astray, specially when running into fantastical creatures like gummy-grizzly-bears and rock candy beasts; and although he desperately wants to go home, he finds himself in the middle of a war between the Cupcake Kingdom and Brownie Kingdom. With his parents lives in danger, it’s up to him to stop Zimmah and restore the world to normal. This is an action-packed roller-coaster which will keep less than enthusiastic readers going for hours! Enthusiastic readers will gobble it up, which may have them feeling sick and craving a nice drink of plain water, since the sugar-rush in this confectionary encrusted world is sickly sweet. Ten-year-old Karim soon realises that all that sugar is not good for you. In fact, he longs for his imperfect life back, but the genie (sorry, djinn) is out of the bottle and he is unstopperable. Wishing for a perfect world to replace the miserable one where his parents are heading for a divorce and he is caught in the middle seems harmless enough. But our warped djinn thinks a perfect world can leave his parents warring over cupcakes and brownies, just as they have argued in real life. No, this IS real life, the genie has turned it into a nightmare, but there’s no way back unless Karim can get the djinn under control. Easier said than done. It’s really well written, the story setting is astoundingly original, and any passing resemblance to Aladdin soon passes. The cloying sickness of the sweets doesn’t, and it’s a bit rich for adult tastes. I’m sure the kids will love it. Scott King is a writer and photographer. He was born in Washington D.C. and raised in Ocean City, Maryland. He received his undergraduate degree in film from Towson University, and his M.F.A. in film from American University. “DAD! A Documentary Graphic Novel,” King’s first book was published in Fall ’09. He is also the creator and writer of “Holiday Wars” and he is known for his board game photography, specifically his annual calendar that highlights tabletop and hobby games. ← Poll: What do you like about my blog? I’m so happy you enjoyed it! Thank you so much for hosting a tour stop and sharing your thoughts! I like the sound of the originality of this one! Might be one to check out, just for the sake of knowing about something different 🙂 As long as I can handle the sugar rush.